Charlotte Smarty Pants: Ski Country Sports January Sale is Here! Home Health	Smarty Alert: Ski Country Sports January Festival of Savings is Here! Smarty Alert: Ski Country Sports January Festival of Savings is Here! Smarties, this is a B-I-G sale just in time for the kick-booty winter ski season that is now upon us. Thank you, Mother Nature! 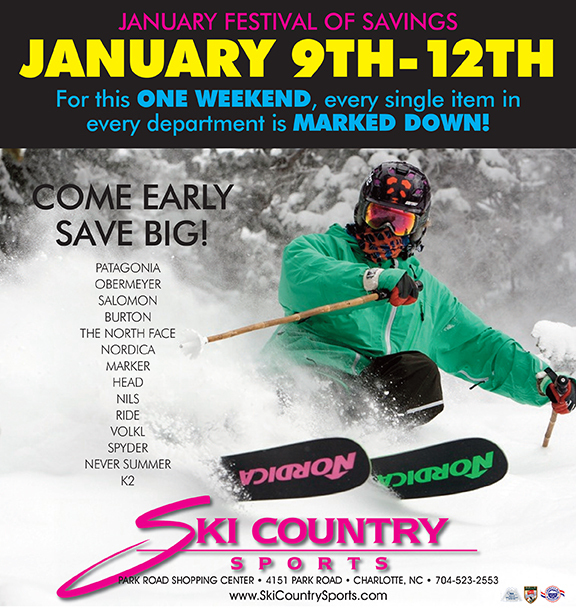 Our Smarty friends at Ski Country Sports are hosting their annual January Festival of Savings Sale and it starts today! This stuff will fly out of the store, so get there early! We’ll race ya! “Mommy Brain” – It Really Does Exist!